Very good quality product at a reasonable price. Digital video recording feature is the plus point. Box doesn’t look very trendy. 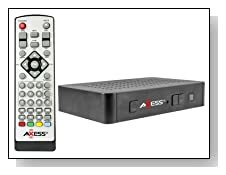 There are many digital converter boxes out there but very few are worth buying, we found Axess CB 3001 is one of them. This device has got many good features which are missing in other products. Price of this product is also very reasonable considering the key features and market competition.If you are expecting durable and a better quality ATSC digital TV converter than this is the product you should consider. This device has very good signal reception capability which can pull even weak over-the-air signals. You can watch tons and tons of channels with great audio and video quality at free of cost. Your older standard definition TV will surely get a new life with this device and will transform your television viewing experience. This product does really good job in what it is meant for. Watching an interesting program or game and would like to watch it again with your family and friends? Just plug in a USB flash drive or external hard disc and record the program. Yes, this device gives that great option which is missing in other digital converter boxes. With this device you can store any live programs and replay them at your convenient time. This device can be used as media player which can read all types of audio and video formats. Axess CB-3001 comes with HDMI output which can be easily plugged in to any display units like analog TV, projector or a computer monitor. You can switch the picture size depending in the screen size of display unit. It s supports 3:4 ratio, center image and full screen display. The output from the device is HDMI 1080P which gives very good quality of video in every screen size. Over all the product meets the defined specifications and gives very good audio and video quality. Signal reception is very good compared to other products and gives many additional benefits like digital video recording, media playback etc. We found this digital converter box gives very good television viewing experience and worth for the money.